Two of the most common frustrations I hear from clients involve their struggles to get marketing content from their in-house resources and to have these same resources share content. Everyone is busy, and nobody seems to have the time to contribute to their law firm’s content marketing efforts – a collective pain point shared by other B2B businesses. Content Marketing Institute’s 2014 Benchmarks, Budgets and Trends identifies eight barriers that marketers face with their content marketing programs. Sound familiar? Now that I’ve established what you already know, what are some things you can do to inspire and motivate yourself and your content contributors? One way to get the maximum mileage out of your content is by developing clever repurposing and strategic distribution processes. Share your blog on your and your firm’s social media accounts. Email firm members a link to your blog so they also can distribute through their social media channels. 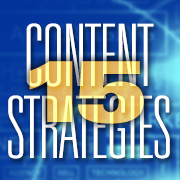 Develop new blog posts or refresh old blogs that expand on or extrapolate from your law firm’s most popular content. Refresh and repost to your law firm’s website and through your social media channels. Turn a blog into a slideshow presentation and post on presentation-sharing sites like Slideshare.net. Pitch speaking engagements for attorneys that are relevant to your topic. You’ll already have a solid start to your presentation with your blog and slideshow file. Create a video or podcast version of your blog, and post to relevant social media sites and video sharing sites such as YouTube and Vimeo. Develop a webinar based on your blog, including time for participants to ask questions. Turn your blog into a FAQ page on your website. Turn the FAQ page into a “How to” guide. Find related blogs on your law firm website and package them together as an e-book. Upload e-books to free e-book sites like ebook88.com. Create an email “drip” campaign that sends out e-book “chapters” once a week to a targeted database. Push your blog out to relevant media sources via social media, particularly Twitter. If a reporter needs a source quote, you may be top of mind. Create a press release, or have your PR firm develop a media pitch if your blog is newsworthy. Use legal news distribution and syndication sites like JD Supra, The National Law Review, or Lexology for expanded reach. *Hint: Be sure to include relevant links back to your website for SEO value and to drive traffic back to your website. You probably won’t pursue all 15 tactics for each blog post you write, so pick and choose those content repurposing ideas that are most relevant to your topic and that will give you the maximum mileage. Repurposing stellar content will help improve your site’s SEO, broaden your reach, position your writers as authorities, expand brand awareness and just maybe motivate your content contributors. If you have other strategies for repurposing and distributing content, add a comment below or email Melanie Trudeau at mtrudeau@jaffepr.com. I always use maximum of methods that you listed on this blog for write-up. Some of points are really interesting like uploading e-books, create a press release. Thanks for sharing information. Certainly there is still a lot for law firms to understand develop in this area still, so it is great to see how some law firms are getting to grips with it better than others! I see you mentioned JD Supra at the end so I thought I would let you know about our new content marketing website/platform that has just launched - http://www.primaryopinion.com. Some of the features that makes us different is a free to contribute option, which allows us to provide readers with a far broader range of legal articles, including from leading bloggers. Our visual design and reader experience is appealing and for contributors we offer other services such as automated RSS feed ingestion from their websites, auto-distribution to their own social media channels, all designed to make things easier and expand their audience distribution.